“I went to see my GP because I had a cyst in my breast. I’d had cysts before, and I was expecting this to be a usual appointment, where the cyst would be drained and that would be it. This time however, the mammogram showed something unexpected behind the cyst. They did some biopsies while I was there, and I was taken into a room and told that they had found something suspicious; it could be cancer, but they wouldn’t know until they had more results back. All I could say was “Oh, bugger!”. The consultant said “well, I’ve heard stronger than that but I can live with ‘Oh, bugger!’”. I was completely oblivious to the idea that this appointment might be any different from previous ones, so I didn’t have anyone with me. It would have been great to be fore-warned, but of course they can’t do that until they have done the biopsies. I had a long wait of a week, which felt like a month, before I got the news that, yes, I did have breast cancer. From there on I thought, well, OK, what do we do now? My mum had died eight months earlier from secondary bone cancer, so I was prepared for it from a carer’s point of view, but not from a personal point of view. I knew rather more than most people would do, which helped. e time I just walked around with nothing on my head- even though it was winter, I had hot sweats as a result of chemo so it was more comfortable. At home we called these hot sweats ‘tea-towel moments’, because that is what I needed to wipe my baldy head. thing”. Actually nobody did say anything. I went into the whole thing with a bit more confidence and self-assuredness, and I think that really helped. People embraced it and it was fine. I tried to make light of what I was going through. I had 21 sessions of radiotherapy, which was there to completely make sure they had caught every cell of the cancer. It’s a quick and simple process and it didn’t hurt, but it was exhausting. They put little tattoos on your skin to make sure the treatment is going in the right place: my husband had always said that he’d divorce me if I ever got a tattoo but now I’ve got three and he’s assured me these ones don’t count, so he’s still here! It does cause a bit of soreness on your skin, but there are creams that help a lot. It’s a bit like sunburn and I ended up with a nice golden brown tan on a really small part of my skin, while the rest of me stayed white! I was given Tamoxifen but I didn’t take to it. I was then put on Anastrazole instead; this is normally given to post-menopausal women and because I hadn’t gone through the menopause yet, I also had to have hormonal implants once a month for the next four years, in my stomach. These aren’t comfortable and I was so glad when I had my last one. 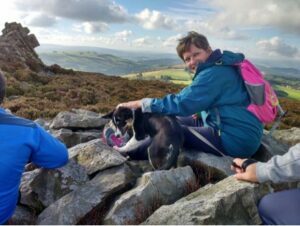 I do have some life changing side effects from the treatment – I suffer from Lymphedema, which affects my right arm and has impacted my ability to do the things I enjoy – I used to do a lot of sewing, patchwork and knitting but now this is more difficult. I have osteoporosis, and the hormonal treatment has sped up the development of osteoarthritis. I have also lost a number of teeth and now rely on a lot of falsies – I would encourage anyone about to go through treatment to really pay attention to your dental health- chemo and radiotherapy can both cause tooth decay and gum issues. I’m now five years cancer-free; I’ve got my hair back; I’ve finally taken my last pill and had my last hormonal implant. I’ve made it through five years and despite it being hell at times, it feels like it has given me ‘permission’ to do what I want to do. I’m not going to feel obliged to keep doing a job I don’t like. I’ve always wanted to help people so I decided to retrain as a fitness instructor and I recently gained my Level Four Cancer and Exercise Rehabilitation qualification. I’ve had great support from Macmillan, and from Lingen Davies through the equipment the charity has funded to get me through chemo and radiotherapy. The Hamar Centre [at Royal Shrewsbury Hospital] have helped me psychologically; I struggled to get my head around the effects of lymphoedema and I now say that if anyone argues with me, my right hand is my boxing hand – it’s got a lot more weight behind it! 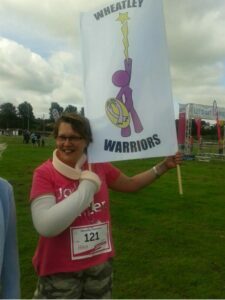 I did a Race for Life not long after my treatment with my “Wheatley Warriors” team and again for the following 3 years. 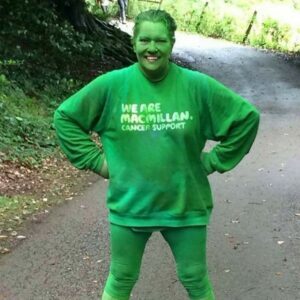 I do a lot of voluntary work for Macmillan, getting involved in fundraising, photography and throwing paint at Hawkstone Park colour run. I act as a Patient Champion at the Royal Shrewsbury Hospital, talking to patients who are newly diagnosed or just starting treatment. If we aren’t willing to stand up and say those things [about our experience], and be open and honest to say these things to people, how are they going to know what to expect? I am more than happy to speak out, if it is going to help others. Yes, it’s scary. Yes, you don’t know what’s round the corner. Yes, you wonder how they know I’m definitely cancer-free after five years. But I’m still here, and I’m prepared to talk to other people and say, “you’ll go through some horrible moments but good can come out of it, and everybody is going to do everything they can to make it work.